One of my very favourite side dishes at my house is my spicy potatoes as I call them. Everyone loves spicy food in my house and this recipe takes no longer than 15 minutes to make. I usually make it as a side dish but sometimes if I am craving it, I will make it as a snack. It’s one of those dishes that I always make sure I have the ingredients on hand because they are versatile and don’t take up a lot of space. Hope you guys enjoy it! Heat a pan with 1 tbsp of butter and 1 tbsp of oil. Add chopped onions, garlic, and chili flakes cook until softened. Add frozen hashbrown and cook for 5 minutes add jalepenos and soup mix. 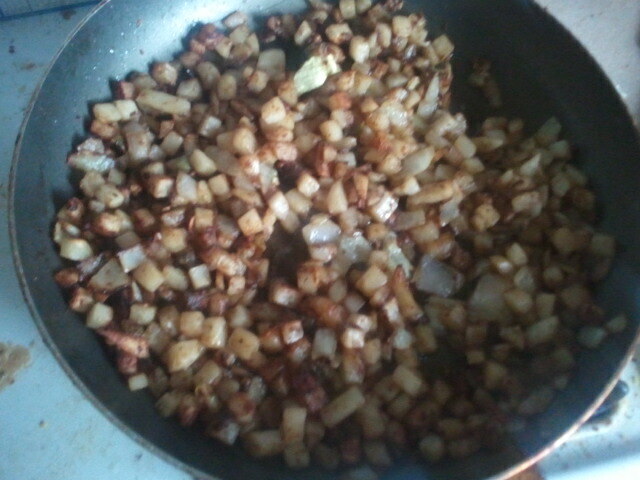 Cook until hashbrowns are golden brown and crispy. Sometimes I’ll add cheese or sour cream to it as something different. If you don’t like spicy, try it with regular diced sweet peppers and omit the chili flakes.